I’m looking for a bash template that uses zenity or yad to maintain a list of records. 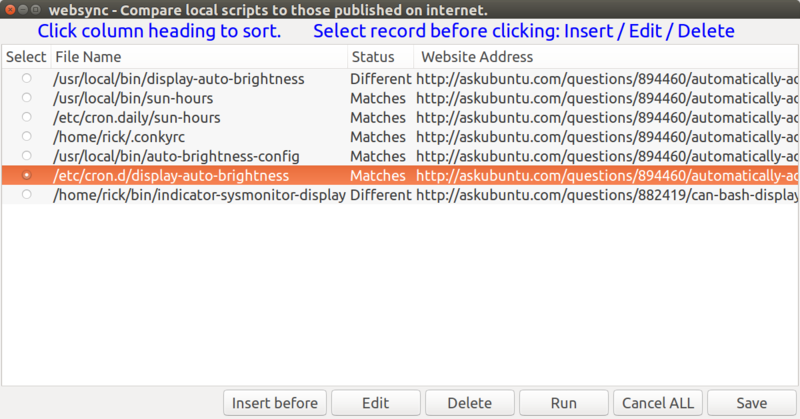 The template could be a shopping check list with print option or it could be a list of servers to monitor ping time. In either case I’d like to take that code and adopt it to my needs. Insert before (insert before selected record). A new input form is mounted to enter fields. Edit (edit selected record). Mounts same form as "Insert before" except with existing values displayed. Delete (delete selected record). Contents of existing record are displayed and confirmation is requested. Run - runs a lengthy update process that updates status column with “MatcheOK / Different / Error”. User is prompted to run update on selected record or all records. Progress display bar displayed when all records are processed. Cancel ALL - DO NOT save any changes and exit bash script. Pressing Escape or closing window by clicking X performs same action. If any records have been changed, confirmation is requested. Save - save changes to disk and exit bash script. NOTE: It appears zenity only allows relabeling “OK” and “Cancel” buttons. New buttons cannot be defined in zenity. 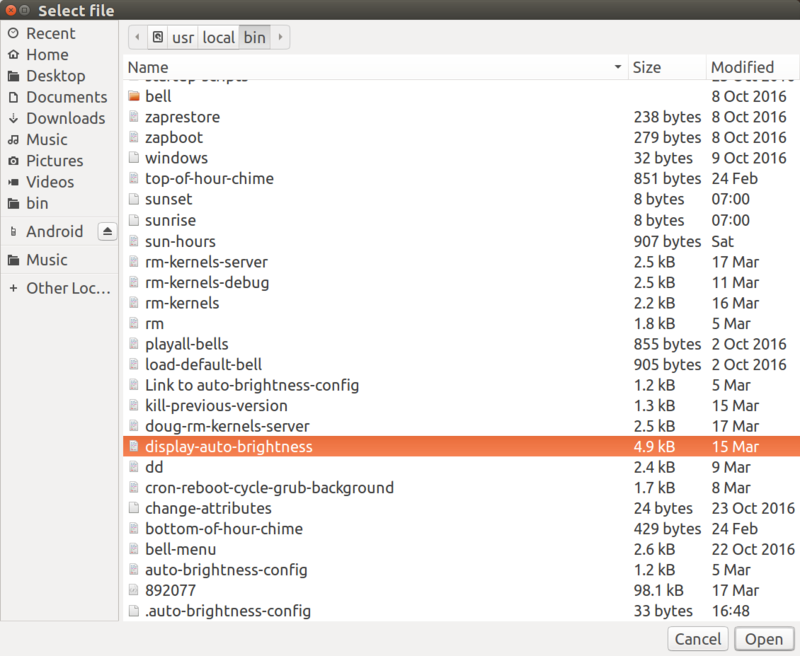 As such yad (Yet Another Dialog) which is installed by default in Ubuntu, and based on zenity, is the way to go. However zenity remains in the question because a script based on it can be easily converted to yad. NOTE: I’m not looking for a complete solution but something close which can be adapted to this project. Although this project uses a flat text file an existing script that uses SQL, ISAM or RDMS could be adapted. The only imperative is it is written in bash and not python, perl or C, etc. Can anyone point out an existing bash script that uses zenity (or yad) to insert/edit/delete records? Notice the "File name" field. When you enter it the file selection dialog box in the first section appears. Here is the bash code to make the sample YAD insert/edit/delete records template. Note extra coding is still needed to read in the file and add processing logic for the "Run" command. Additional coding is probably required to support file names with embedded spaces but that hasn't been tested yet. # DESC: Provide list of files and corresponding website addresses. # DATE: Mar 25, 2017. # NOTE: Uses yad which is fork of zenity which is GUI fork of dialog. # TODO: Add local file date modified. Add Answer last revision date. #       Add file word count, or size, or ignore as irrelevant? #   Add answer word count if file word count is displayed. #       Add answer up votes. # Must have the yad package. # Must have the zenity package. # This is called after inserting or deleting records. # Record nubmers must be unique as they are used to find the correct record in ListArr array. 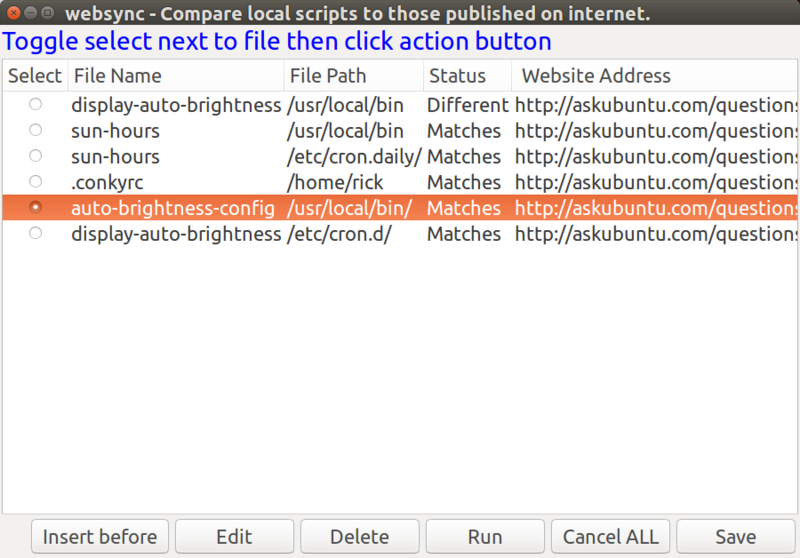 # Matching on "file name" or any other field is impossible because there may be duplicate names. # echo "Renumber i: $i j: $j"
# Button values 1 and 3 don't work for returning selected record for some reason??? # Button values 11, 13 and 15 don't work either. 12, 14 and 16 work. # Therefore use Button values (10, 20, 30...) for readability. # Insert before || or Edit ? # --text="Set fields and click OK to update"
# OK & Insert operation? # OK & Edit operation? # --text="click OK to confirm delete"
zenity --question --text "You have made $TransCount change(s). Do you really want to cancel?" zenity --error --text "~/bin/websync - Unknown button return code: $Action"
Hopefully this saves others lots of time getting their own record management system going using bash and yad. Of course more bullet proof and probably faster methods can be done using Python or C but that probably comes at the expense of more lines of code and higher learning curve. At the end of the day this project is targeted at those that want to learn more about bash and what can be accomplished in a bash-only environment. Perhaps AskUbuntu is the wrong forum for posting this and Stack Overflow or Unix & Linux forums might be better Stack Exchange candidates. I look forward to comments on that as I'm really not sure the best place. Not the answer you're looking for? Browse other questions tagged command-line bash scripts zenity yad or ask your own question. How to edit YAD question labels (example)? Can BASH display in systray as application indicator? How do I delete a directory from a zip file using a bash script? How to use readline to insert a predetermined string onto the command line with a shortcut when using Bash? How can I delete a file if it starts with <html> in bash?